Then, with my pants down, the urologist asks me if he has ever done a prostate exam on me. I’m going to go out on a limb here and state that never in the history of mankind has this question been asked and a patient has responded with an enthusiastic “yes!” I was sheepish, but Kathy said, “You’re already here and your pants are off, why not?” Why not, indeed. This was perhaps some very limited revenge for all she had endured through the seven pregnancies. I soon learned that the words of comfort offered by the doctor in the film Fletch (3) are also part of this urologist's repertoire with these exams. He complemented me on the smoothness of my prostrate (4) and then led me to the room where the real business was to occur. I was asked to remove all clothing below the waist and wait for the doctor to arrive. (5) I later learned that every other person I knew that had had this procedure was given Valium. I was not offered Valium. I have on occasion taken Valium and am aware of its effects. All I was offered was a prostate exam and I can, from experience, clearly tell the difference between the two. The doctor offered me his iPod to listen to during the procedure. Since he was about 140 years old, I was expecting a fine selection of either Tommy Dorsey or Glenn Miller and his Orchestra. Surprisingly, there was an eclectic mix of old and new. I quickly spied Pink Floyd’s Dark Side of the Moon and remarked to myself that I hadn’t listened to that in a long while. So, on it went. The doctor entered and began to remove excess hair in the area often referred to as the “business district.” (6) Then came the needle. He told me to expect to feel a “little pinch.” What I felt was not a “little pinch,” but what felt like a six-inch needle being inserted into my scrotum and left nut. While this was happening, I was listening to the beginning of Dark Side where there are all the voices talking about being insane. The musical choice was not as soothing as I had hoped. Soon after, the general area was numb. From my position, lying flat on my back, I could see the doctor at work. I could see the blunt end of instruments in his hands. His hands were moving back and forth over my junk. I couldn’t think of it that way and remain calm. So I imagined his hands moving over a generous selection of deli meats, cheeses and condiments, perhaps making an impressive sandwich. After what seemed like an eternity, but was probably 15 minutes, the sandwich making was done. One half of the sperm delivery system had been sabotaged. I opened my eyes and looked down just in time to see a puff of smoke from cauterization. It was white smoke. The burning smell was off-putting. I was able to quickly move past that when the six-inch needle reappeared -- time for the other side. Another “little pinch,” another dagwood sandwich and another new pope later, I was sterile, at least in theory. 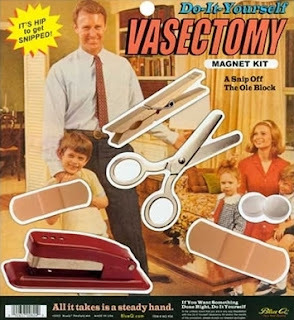 Prior to the procedure, the doctor had made a point of saying that there is about a 95% success rate with vasectomies, but that his success rate was a little higher. I wondered which of all the valley’s urologists had bragging rights to having the highest success with sterilizing men? He bandaged me up with about 37 feet of gauze held in place by a jock strap. As I sat up, he asked if I wanted to see what he removed. Uh, no, I don’t think so. I delicately put on my pants and slowly limped to the waiting room where my ride was waiting. There were probably 5 - 8 men waiting their turn, and I can only imagine what they thought of my bandaged-scrotum-induced walk of shame. There was a week or so of recovery that included some shame-walking, some fear of bandage removal (8) and eventually a return to normalcy. Well, almost a state of normalcy. I can no longer listen to Dark Side of the Moon without crossing my legs. (1) I am reminded of the old joke that mormons don’t believe in having children past 35, cause 36 kids are too many. (2)Vasectomies get their name because it is the process that severs or ties the vasa deferentia, which incidentally is not an early name for a David Lee Roth band. (4) We Sopers are known for our smooth prostates. (5) From the “All of this has happened before” file, this was not the first time I found myself in this position. Several years earlier, I had to get an ultrasound of the high-rent district which involved pants around my ankles and being subjected to some serious poking and prodding. Lest you think I am a floozy of some sort, beyond these two times I never got myself into a position like this unless it was proceeding by at least dinner and a movie. (6)Other similar names include: high-rent district, money-maker, etc. (7) Kathy, my wife, believes that readers might not be familiar with the process and thought that a footnote would be helpful here. (8)I had an irrational fear that I’d remove the bandage to change it or bathe and “something” would fall out.